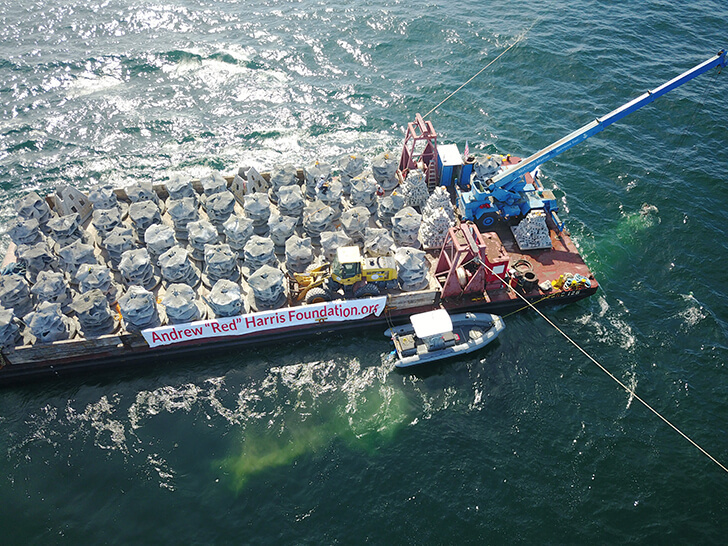 The Andrew “Red” Harris Foundation breathed new life into south Florida’s marine ecosystems with a massive artificial reef deployment about a mile and a half offshore of the Jupiter Inlet in August. The $500,000 deployment is the largest ever conducted by a private foundation on Florida’s east coast. 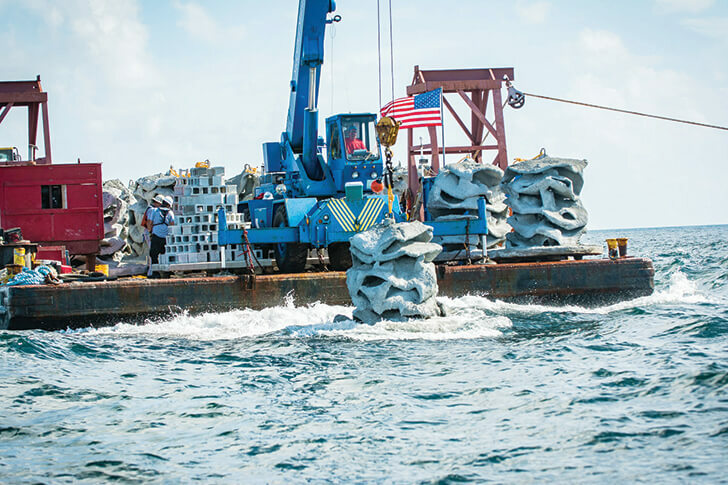 While the sheer size of this deployment is impressive, what makes this project unique is the design of the artificial reef modules, as they mimic natural reefs. Additionally, these reef modules cause scouring along the ocean floor, which exposes bedrock and aids in the recruitment of algae, soft corals and sponges. The modules weigh 4 tons each, and 134 of them were deployed on Aug. 9 along with 1,000 tons of boulders. ENGEL, the leader in AC/DC fridges and freezers, high performance roto-molded coolers, vacuum insulated drinkware, outdoor adventure gear and soft-sided coolers, and No Shoes Reefs—a joint venture of ENGEL and Kenny Chesney’s No Shoes Nation—participated in the historic deployment. The venture was partly funded by dollars raised by No Shoes Reefs, which donates a portion of the sales of No Shoes Nation-branded products to building artificial reefs in the Gulf of Mexico, Atlantic Ocean and surrounding rivers and waterways. ENGEL Coolers Vice President, Mike Dixon, who serves as a board member for the South East Florida Coral Reef Initiative (SEFCRI), is very passionate about ENGEL’s role in reef creation and preservation. For more information about No Shoes Reefs, or to purchase a limited edition No Shoes Reefs shirt or hat, visit noshoesreefs.org. The t-shirts and hats feature the No Shoes Reefs logo, as well as the No Shoes Nation skull and cross bones. Close to 40 percent of the proceeds from sales of these items goes to support the reefs. Look for future No Shoes Reefs products from ENGEL in the future.